Forte grew up in Slidell, Louisiana, and graduated from Slidell High School in 2004, where he was a letterman in football and track & field. As a junior, he rushed for 1,057 rushing yards with eight rushing touchdowns, and caught 30 passes for 365 yards and three receiving touchdowns. As a senior, he was named the St. Tammany Parish Player of the Year, District 5-5A Offensive MVP and received All-Metro selection accolades, as he gained 1,375 yards with 23 touchdowns and caught 18 passes for 253 yards and two rushing touchdowns. He totaled 2,432 rushing yards and 31 in his career while also catching 48 passes for 618 receiving yards and five receiving touchdowns. As a standout sprinter, Forte competed in track and had some of the better 100m and 200m times in the New Orleans area in 2003, with personal-bests of 10.68 seconds in the 100 meters and 22.10 seconds in the 200 meters. "2004 Tulane Football Commitment List". Rivals.com. Retrieved August 3, 2012. "2004 Team Ranking". Rivals.com. Retrieved August 3, 2012. Forte played NCAA Division I college football at Tulane University in New Orleans, Louisiana, a member of Conference USA. He lettered for four years and played for three while pursuing a degree in finance. As a freshman, he had 624 rushing yards and four rushing touchdowns to go along with 20 receptions for 180 yards and two receiving touchdowns. As a sophomore, he had 655 rushing yards and four rushing touchdowns to go along with 23 receptions for 163 yards and one receiving touchdown. His junior year was cut short when he suffered an injury in the game against Marshall. He finished his junior season with 859 rushing yards and eight rushing touchdowns to go along with 28 receptions for 360 receiving yards and two receiving touchdowns. His standout season was his senior year, coming off a knee injury, Forte set several Tulane school records, including rushing for 2,127 yards and 23 touchdowns. He had five 200+ yard rushing games, two 300+ yard games, and three games with at least four rushing touchdowns during the 2007 season. Forte was the only BCS non-AQ conference athlete to be a semifinalist for both the Maxwell and Doak Walker Awards and to make the Walter Camp Player of the Year List, and one of just 3 players nationally to be named to all three lists. Forte garnered the most attention at the 2008 Senior Bowl in Mobile, Alabama, and walked away with the Overall MVP award. He led with 59 yards rushing on 8 carries; 4 receptions for 38 yards and a tackle on special teams. 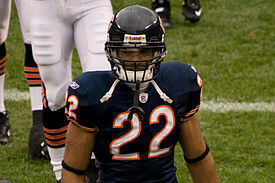 The Chicago Bears drafted Forte in the second round of the 2008 NFL Draft as the 44th overall selection, the sixth of 23 running backs taken that year. He was originally drafted to compete with Cedric Benson for the team's starting running back position. However, Benson was released from the Bears after legal complications, and Forte out-competed Adrian Peterson and second-year running back Garrett Wolfe and started all 16 games. In the regular season debut on September 7, 2008 against the Indianapolis Colts, he carried the ball 23 times for 123 yards (setting a franchise record for most debut rushing yards) and scored his first career touchdown on a 50-yard run en route to a 29–13 victory over the Colts. His efforts earned him Sunday Night Football’s “Horse Trailer Player of the Game” award. He had two more 100+ yard rushing games on the season, and in Game 12 became the first Bears rookie to rush for over 1,000 yards since Anthony Thomas in 2001. He finished with franchise rookie records of 316 carries for 1,238 rushing yards (the latter since broken by Jordan Howard in 2016). His 1,715 yards from scrimmage was third in the NFL, and broke Hall of Famer Gale Sayers's team record of 1,374 in 1965. Forte led all rookie running backs in total yards and receptions, those 61 receptions also breaking Mike Ditka's 1961 franchise rookie record. He received one vote for the National Football League Rookie of the Year Award, finishing behind Ryan Clady, Chris Johnson, and Matt Ryan. Forte recorded just 150 total yards over the first three games of the season, before his first big game in Week 4 against the Detroit Lions, during which he rushed for 121 yards and scored his first touchdown. He averaged 50.6 yards per game over the next 11 games with just three touchdowns, before a 101-yard finale in the second divisional game against the Detroit Lions. His 929 rushing yards was 18th in the league, down from seventh in his rookie season. In a preseason game against the Oakland Raiders, Forte ran for an 89-yard touchdown, which would have been the longest run in Bears history if it had occurred during a regular season game. In the regular season opener, Forte had a career-best 151 receiving yards including two touchdowns, one of 89 and a game-winning 28 yarder; he was named NFC Offensive Player of the Week. In Week 5 against the Carolina Panthers, Forte had touchdown runs of 18 and 68 yards, the latter a career long, on the way to 166 total rushing yards on the day. Forte was named FedEx Ground Player of the Week for this week. In Week 11 at the Miami Dolphins, the season's first Thursday Night Football game, Forte rushed for 97 yards on 25 carries and scored the game's only touchdown on a 2-yard run in the fourth quarter as the Bears shutout the Dolphins, 16–0. Over the last seven games of the season, Forte had at least 90 rushing yards in five of them. His 1,616 yards from scrimmage ranked tenth in the NFL. The Chicago Bears finished with an 11–5 record and made the playoffs. In the Divisional Round, Forte recorded 80 yards rushing and 54 yards receiving in a victory over the Seattle Seahawks, and became the only player in Bears post-season history with 10+ receptions in the 21–14 loss to the Green Bay Packers in the NFC Championship. Forte began the season primarily as a receiver. He recorded 68, 49, and two rushing yards in his first three games; buthad 90, 117, and 80 receiving yards, respectively. This changed in Week 4, when Forte rushed for a career-high 205 yards and one rushing touchdown against the Carolina Panthers, starting a stretch of four 100+ yard rushing performances over the next five games. Through nine games, Forte lead the Bears in rush attempts, rush yards, receptions, and receiving yards; and through Week 8 led the league in yards from scrimmage. In a game against the Philadelphia Eagles, Forte joined Herschel Walker as the only players with 700 rushing yards and 400 receiving yards in their first four seasons, and became the only player with 900 rushing yards and 400 receiving yards. After three less productive games, Forte sprained his MCL in a loss to the Chiefs, ending his season with 997 rushing yards, three rushing touchdowns, 490 receiving yards, and one receiving touchdown. However, he was placed on the NFC team for the 2012 Pro Bowl for the first time in his career, making him the first Bears running back to be named to the Pro Bowl since Neal Anderson in 1991. On March 2, 2012, Forte was given the franchise tag by the Bears, worth $7.74 million. However, Forte expressed his frustration and refused to sign the tender, which eventually led to the Bears signing Michael Bush. Forte then held out for a long-term contract, skipping the organized team activity (OTA) workouts, before finally agreeing to a four-year, $32 million deal. In Week 2 against the Green Bay Packers, Forte sustained an ankle injury when he was tackled by Packers cornerback Charles Woodson, originally reported as a dangerous "high ankle sprain" but later down-graded and he only missed one game. On the season, he had three 100+ yard rushing performances, and one game with 50+ yards receiving. Forte ended the 2012 season with a career-low 44 receptions for 340 yards, and dropped out from the top 10 in yards from scrimmage. In Week 3 against the Pittsburgh Steelers, Forte had a 55-yard run, and the following week against the Detroit Lions, had a 53-yard run, making him the first Bears running back to record runs of 50+ yards in back-to-back games since Raymont Harris in 1997. Two weeks later, against the New Orleans Saints, Forte passed Rick Casares for third in the all-time leading rusher list with 5,702 career yards, behind Walter Payton and Neal Anderson. In Week 7 against the Washington Redskins, Forte scored three rushing touchdowns. Against the Detroit Lions in Week 10, Forte recorded 49 yards from scrimmage to bring his season total to 1,023, and became the first player in Bears history and 18th NFL player to record 1,000 yards from scrimmage in each of his first six seasons. On November 24, 2013, Forte passed Neal Anderson for the second most career rushing yards in Bears franchise history. On December 27, Forte was named to the 2014 Pro Bowl. In the Week 17 loss to Green Bay, Forte recorded his 20th 100-yard rushing game, tying Gale Sayers for the second-most in Bears history. He also had three touchdowns, becoming the third Bear with two three-touchdown games in a season. Forte ended the 2013 season with a career-high nine rushing touchdowns along with 1,933 total yards from scrimmage, fifth-most in team history and the second-most behind Payton. Forte also had 1,339 rushing yards during the season, the ninth-most in franchise history. Forte's 1,339 rushing yards ranked second in the NFL in 2013, while his all-purpose yards from 1,933 yards ranked fourth. Following the regular season's conclusion, Forte was one of three finalists for the FedEx Ground Player of the Year Award, but finished runner-up to LeSean McCoy and Jamaal Charles. In 2014, Forte solidified his reputation as one of the best receiving backs in NFL history, with five or more receptions in 14 of 16 games. This included twelve receptions for 105 yards in the fifth game, followed by ten receptions for 77 in the sixth game, becoming just the fourth Bear (since joined by Alshon Jeffery in 2015), and the second running back in NFL history with back-to-back 10+ reception games. He ended the season with 102 receptions, breaking Larry Centers' 1995 record for running backs, which was later eclipsed by Carolina Panthers running back, Christian McCaffrey in 2018. Forte also had three 100+ yard rushing games, and nine games with 100+ yards from scrimmage. He passed 1,000 yards rushing for the third consecutive season (joining Neal Anderson and Walter Payton as the only Bears to do so), and for the fifth time in his career (second only to Payton). Forte began his 2015 season with a season-best 141 rushing yards against Green Bay, his best since the 2011 season. In Week 3, Forte had zero receptions snapping a streak of 49 consecutive games, 17th all-time among running backs. His production was sub-par even before a knee injury at the hands of Minnesota's Harrison Smith sidelined him for three games. In 13 games in the 2015 season, Forte rushed for 898 yards and four touchdowns, and caught 44 passes for 389 yards and three touchdowns, a then-career-low 1,287 yards from scrimmage. He was ranked 90th by his fellow players on the NFL Top 100 Players of 2016. On March 9, 2016, Forte signed a three-year, $12 million contract with the New York Jets. In his Jets debut, during their season-opening loss against the Cincinnati Bengals, Forte had 22 carries for 96 rushing yards and five catches for 59 receiving yards in the 23–22 loss. The following week, he finished a 37–31 victory over the Buffalo Bills with 30 carries for 100 yards and tied a career-high with three rushing touchdowns. On October 23, 2016, Forte carried the ball 30 times for 100 yards and a rushing touchdown while also making four receptions for 54 receiving yards and caught his first touchdown reception of the season in a win over the Baltimore Ravens. He was placed on injured reserve on December 30, 2016 with a knee injury. The 5–11 Jets frequently fell behind early in games, and Forte split rushing duties with Bilal Powell. He finished his first season as a Jet with a career-low 813 rushing yards with seven touchdowns to go along with 30 receptions for 263 yards and one touchdown. Forte had a career-low 152 yards from scrimmage in his first three games before a toe injury sidelined him for two weeks, allowing Bilal Powell to emerge as a legitimate replacement. He did not have a game with 10 rushing attempts until Week 9, when he scored his first two touchdowns of the season against the Buffalo Bills. He was placed on injured reserve on December 30, 2017 after battling a knee injury for most of the season. On Christmas Eve, against the Los Angeles Chargers, he had 19 rushing yards and seven receiving yards in what would be his final professional game. Overall, he finished the 2017 season with 381 rushing yards, two rushing touchdowns, 37 receptions, 293 receiving yards, and one receiving touchdown. On February 28, 2018, Forte announced his retirement from the NFL after 10 seasons. The Chicago Bears honored both Forte and former teammate Devin Hester on April 23 during a press conference at Halas Hall. The two players signed ceremonial one-day contracts to retire as members of the Bears. Bears chairman George McCaskey praised Forte's legacy with the Bears, lauding the former running back as "a superior athlete and frequently the best player on the field — among the best in a long line of great Bears running backs." Forte married Danielle Daniels in August 2011. The couple has two children, Nala (born in 2013) and Matthew (born in 2015). Forte and his family resided in Mettawa, Illinois during his tenure with the Bears. Forte is a Christian and attends weekly team Bible studies and chapels. Forte has spoken about his faith saying, "When people look at me, I don’t want them to just see football. I want my faith to speak for me and that it’s about more than that. It’s about reaching out to others and telling them about your faith." ^ Ingrassia, Nunzio (March 23, 2016). "Matt Forte hasn't fully gotten over how his time with the Bears ended". Fox Sports. Retrieved March 24, 2016. ^ Nunez, Tammy. "Chicago Bears running back Matt Forte returns to Slidell to teach kids football, help purchase gear". NOLA.com. Retrieved March 3, 2018. ^ "Matt Forte College Stats". College Football at Sports-Reference.com. Retrieved March 3, 2018. ^ "Matt Forte 2004 Game Log". College Football at Sports-Reference.com. Retrieved March 3, 2018. ^ "Matt Forte 2005 Game Log". College Football at Sports-Reference.com. Retrieved March 3, 2018. ^ "Matt Forte 2006 Game Log". College Football at Sports-Reference.com. Retrieved March 3, 2018. ^ "Matt Forte 2007 Game Log". College Football at Sports-Reference.com. Retrieved March 3, 2018. ^ "Southeastern Louisiana at Tulane Box Score, September 22, 2007". College Football at Sports-Reference.com. Retrieved March 3, 2018. ^ "Tulane at Army Box Score, October 6, 2007". College Football at Sports-Reference.com. Retrieved March 3, 2018. ^ "Tulane at Alabama-Birmingham Box Score, October 13, 2007". College Football at Sports-Reference.com. Retrieved March 3, 2018. ^ "Tulane at Southern Methodist Box Score, October 20, 2007". College Football at Sports-Reference.com. Retrieved March 3, 2018. ^ "Memphis at Tulane Box Score, October 27, 2007". College Football at Sports-Reference.com. Retrieved March 3, 2018. ^ "Tulane at Rice Box Score, November 17, 2007". College Football at Sports-Reference.com. Retrieved March 3, 2018. ^ "Game Scores/MVPs : Game History : The Game : Reese's Senior Bowl". www.seniorbowl.com. Retrieved March 3, 2018. ^ "2008 NFL Combine Stats: Running Backs". footballsfuture.com. ^ "2008 NFL Draft Listing". Pro-Football-Reference.com. Retrieved March 3, 2018. ^ "Chicago Bears at Indianapolis Colts – September 7th, 2008". Pro-Football-Reference.com. Retrieved March 3, 2018. ^ "2008 NFL Rushing & Receiving". Pro-Football-Reference.com. Retrieved March 3, 2018. ^ "Matt Forte 2008 Game Log". Pro-Football-Reference.com. Retrieved March 3, 2018. ^ Kalafa, Jeff (December 12, 2008). "Top Rookie Running Backs....Matt Forte, Chris Johnson, Steve Slaton Lead Group". Bleacher Report. Retrieved January 4, 2009. ^ "Matt Forte – Chicago Bears – Game Log – NFL". Yahoo! Sports. 2009. Retrieved October 11, 2009. ^ "Watch Oakland Raiders vs. Chicago Bears [08/21/2010] - NFL.com". www.nfl.com. Retrieved March 3, 2018. ^ "Detroit Lions at Chicago Bears – September 12th, 2010". Pro-Football-Reference.com. Retrieved March 3, 2018. ^ "2010 NFL Week 1 Leaders & Scores". Pro-Football-Reference.com. Retrieved March 3, 2018. 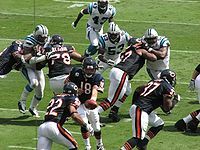 ^ "Chicago Bears at Carolina Panthers – October 10th, 2010". Pro-Football-Reference.com. Retrieved March 3, 2018. ^ "Chicago Bears at Miami Dolphins – November 18th, 2010". Pro-Football-Reference.com. Retrieved March 3, 2018. ^ "2010 NFL Rushing & Receiving". Pro-Football-Reference.com. Retrieved March 3, 2018. ^ "2010 Chicago Bears Statistics & Players". Pro-Football-Reference.com. Retrieved March 3, 2018. ^ "2010 NFL Standings & Team Stats". Pro-Football-Reference.com. Retrieved March 3, 2018. ^ "Divisional Round – Seattle Seahawks at Chicago Bears – January 16th, 2011". Pro-Football-Reference.com. Retrieved March 3, 2018. ^ "NFC Championship – Green Bay Packers at Chicago Bears – January 23rd, 2011". Pro-Football-Reference.com. Retrieved March 3, 2018. ^ "Carolina Panthers at Chicago Bears – October 2nd, 2011". Pro-Football-Reference.com. Retrieved March 3, 2018. ^ "Chicago Bears at Detroit Lions – October 10th, 2011". Pro-Football-Reference.com. Retrieved March 3, 2018. ^ "Chicago Bears at Tampa Bay Buccaneers – October 23rd, 2011". Pro-Football-Reference.com. Retrieved March 3, 2018. ^ "Chicago Bears at Philadelphia Eagles – November 7th, 2011". Pro-Football-Reference.com. Retrieved March 3, 2018. ^ "Forte is excited to rejoin teammates". Chicagobears.com. July 24, 2012. Retrieved August 3, 2012. ^ "Chicago Bears: Running back Matt Forte no factor in AFC's 59–41 victory over NFC in Pro Bowl – Chicago Tribune". Articles.chicagotribune.com. January 29, 2012. Retrieved July 16, 2012. ^ "Matt Forte 2011 Game Log". Pro-Football-Reference.com. Retrieved March 3, 2018. ^ "Bears sign Forte to a four-year contract". Chicagobears.com. July 16, 2012. Retrieved August 3, 2012. ^ "Tillman among five voted to Pro Bowl". Chicagobears.com. Retrieved July 16, 2012. ^ "Bears put franchise tag on Matt Forte". Chicagobears.com. Retrieved July 16, 2012. 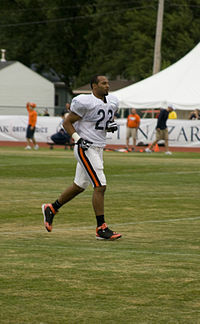 ^ a b "Matt Forte absent as Chicago Bears open minicamp". NFL.com. June 12, 2012. Retrieved July 16, 2012. ^ "Report: Matt Forte won't sign anything but a long-term deal | ProFootballTalk". Profootballtalk.nbcsports.com. Retrieved July 16, 2012. ^ "Matt Forte feels disrespected by Bears' signing of Michael Bush – Chicago Sun-Times". Suntimes.com. March 22, 2012. Retrieved July 16, 2012. ^ "Matt Forte of Chicago Bears considers holdout, source says – ESPN Chicago". ESPN. July 28, 2011. Retrieved July 16, 2012. ^ Brooks, Matt (May 23, 2012). "Matt Forte skips Bears OTAs as contract dispute continues – The Early Lead". The Washington Post. Retrieved July 16, 2012. ^ "Chicago Bears' Matt Forte (ankle) leaves game against Green Bay Packers – ESPN Chicago". Espn.go.com. September 14, 2012. Retrieved September 18, 2012. ^ "Bears: Matt Forte Injury Is Not High Ankle Sprain". SBNation.com. Retrieved September 18, 2012. ^ Mayer, Larry. "Forte thinks he'll be able to play Monday". Chicago Bears. Retrieved September 27, 2012. ^ "Matt Forte 2012 Game Log". Pro-Football-Reference.com. Retrieved March 3, 2018. ^ Mayer, Larry (July 29, 2013). "Forte eager to be more involved in passing game". Chicago Bears. Retrieved July 29, 2013. ^ Mayer, Larry (September 29, 2013). "Larry Mayers's Bears-Lions Game Blog". Chicago Bears. Retrieved September 29, 2013. ^ "Chicago Bears at Pittsburgh Steelers – September 22nd, 2013". Pro-Football-Reference.com. Retrieved March 3, 2018. ^ "Chicago Bears at Detroit Lions – September 29th, 2013". Pro-Football-Reference.com. Retrieved March 3, 2018. ^ Mayer, Larry (October 6, 2013). "Jeffery sets Bears record in loss to Saints". Chicago Bears. Retrieved October 6, 2013. ^ "Chicago Bears at Washington Redskins – October 20th, 2013". Pro-Football-Reference.com. Retrieved March 3, 2018. ^ "Detroit Lions at Chicago Bears – November 10th, 2013". Pro-Football-Reference.com. Retrieved March 3, 2018. ^ "Postgame notes – Bears vs. Lions week 10". Chicago Bears. November 10, 2013. Archived from the original on January 21, 2017. Retrieved November 10, 2013. ^ Stoltz, Jeremy (November 24, 2013). "Forte No. 2 rusher in Bears annals". Scout.com. Dear Report. Archived from the original on December 2, 2013. Retrieved November 25, 2013. ^ Sessler, Marc (December 27, 2013). "2014 Pro Bowl roster analysis: Offense". National Football League. Retrieved December 27, 2013. ^ "Green Bay Packers at Chicago Bears – December 29th, 2013". Pro-Football-Reference.com. Retrieved March 3, 2018. ^ "Chicago Bears Single-Season Rushing Leaders". Pro-Football-Reference.com. Retrieved March 3, 2018. ^ "Matt Forte 2013 Game Log". Pro-Football-Reference.com. Retrieved March 3, 2018. ^ LeGere, Bob (December 29, 2013). "Big season, but Forte wanted much more". Daily Herald (Arlington Heights). Retrieved January 11, 2014. ^ "2013 NFL Rushing & Receiving". Pro-Football-Reference.com. Retrieved March 3, 2018. ^ Mayer, Larry (January 6, 2014). "Forte a finalist for FedEx Award". chicagobears.com. Retrieved January 11, 2014. ^ Smith, Alex (February 1, 2014). "LeSean McCoy Wins FedEx Ground Award". Philadelphia Eagles. Retrieved February 2, 2014. ^ "Matt Forte 2014 Game Log". Pro-Football-Reference.com. Retrieved March 3, 2018. ^ "CHI Players with 10+ Rec in Consecutive Games". Pro-Football-Reference.com. Retrieved March 3, 2018. ^ "Players with 10+ rush attempts and 10+ receptions in back-to-back games". Pro-Football-Reference.com. Retrieved March 3, 2018. ^ "Chicago Bears at Carolina Panthers – October 5th, 2014". Pro-Football-Reference.com. Retrieved March 3, 2018. ^ "Chicago Bears at Atlanta Falcons – October 12th, 2014". Pro-Football-Reference.com. Retrieved March 3, 2018. . As of 2017, James Wilder was the only other player to accomplished this feat, in 1984. ^ SI Wire (Nov 2, 2015). "Chicago Bears: Matt Forte should not need surgery". SI.com. ^ "Matt Forte 2015 Game Log". Pro-Football-Reference.com. Retrieved November 1, 2017. ^ "'Top 100 Players of 2016': No. 90 Matt Forte". NFL.com. ^ "Instagram post by Matt Forte • Feb 12, 2016 at 3:15pm UTC". Instagram. ^ Mayer, Larry (February 12, 2016). "Bears will not re-sign Matt Forte". chicagobears.com. Retrieved February 12, 2016. ^ "Source: Jets to sign RB Forte to replace Ivory". ^ "Cincinnati Bengals at New York Jets – September 11th, 2016". Pro-Football-Reference.com. Retrieved November 3, 2017. ^ "New York Jets at Buffalo Bills – September 15th, 2016". Pro-Football-Reference.com. Retrieved November 3, 2017. ^ "Baltimore Ravens at New York Jets – October 23rd, 2016". Pro-Football-Reference.com. Retrieved November 3, 2017. ^ "NFL Player Profile: Matt Forte". NFL.com. Retrieved November 4, 2016. ^ "2016 New York Jets Statistics & Players". Pro-Football-Reference.com. Retrieved March 3, 2018. ^ Allen, Eric (December 30, 2016). "Jets Place RB Matt Forté on Injured Reserve". NewYorkJets.com. ^ "Matt Forte 2016 Game Log". Pro-Football-Reference.com. Retrieved March 3, 2018. ^ Theodorakis, Andrew (September 29, 2017). "Forte's toe injury opens door for Powell and surprising rookie". New York Post. ^ "Buffalo Bills at New York Jets – November 2nd, 2017". Pro-Football-Reference.com. Retrieved November 8, 2017. ^ Greenberg, Ethan (December 30, 2017). "Jets Place RB Forté on Injured Reserve". NewYorkJets.com. ^ "Los Angeles Chargers at New York Jets – December 24th, 2017". Pro-Football-Reference.com. Retrieved March 3, 2018. ^ "Matt Forte 2017 Game Log". Pro-Football-Reference.com. Retrieved March 3, 2018. ^ "Matt Forte says goodbye to the NFL after 10 seasons". SportsSpectrum.com. February 28, 2018. ^ Knoblauch, Austin (February 28, 2018). "Matt Forte announces retirement after 10 NFL seasons". NFL.com. ^ a b Mayer, Larry (April 23, 2018). "Hester, Forte officially retire as Bears". Chicago Bears. chicagobears.com. Retrieved April 24, 2018. ^ Hendricks, Maggie (July 8, 2013). "Matt Forte Embracing New Baby and Offense". NBC. Retrieved January 4, 2014. ^ Thele, Kyle (December 3, 2015). "Matt Forte celebrates the birth of his son Matthew Christian Forte". Sun-Times. Archived from the original on December 7, 2015. Retrieved December 3, 2015. ^ Rodnick, Dennis (April 15, 2013). "The Bears' Matt Forte Just Bought a Secluded Mettawa Home". Chicago. Retrieved January 4, 2014. ^ "My Story". Archived from the original on January 22, 2016. ^ "Matt Forte's faith a top priority". ^ Mayer, Larry (May 11, 2009). "Forte hits books to earn finance degree from Tulane". chicagobears.com. Retrieved May 11, 2009. ^ Bunting, Wes. "Matt Forte Interview". NFL Smackdown. Retrieved May 11, 2009.